Genesis is proud to be a certified member of the State of Tennessee Department of General Services, Governor's Office of Diversity Business Enterprise and a member of the National Minority Business Council. Genesis can finally make your Supplier Diversity goals a reality. Our customers not only save money on their telecommunications expenses, but also are able to contribute to their annual diversity supplier program at the same time. Our partnerships allow us to solve your needs and with our integrated service your business will end up reducing your communications costs. Since Genesis can work as a Tier 1 or Tier 2 supplier we can work within your existing telecom suppliers' contracts to offer uninterrupted service and support. This also allows your company to keep your current contract or even wait for it to be renewed. It is important to note that what makes us distinctive is what we have to sell. Some industries have room for many, many players while others do not. Regardless of the niche, we must not forget that what got us going in the first place was the distinctive nature of who we are, what we do, and how we do it. That is what makes us special. It is up to us to protect that and communicate it to our customers. We hold to the three "P's": Patience, Perseverance and Plain hard work. Alliances: Doing business with minority suppliers is an excellent strategy. Building partnerships between major corporations and minority businesses makes good sound business sense. Bottom line - minority business is everybody's business. And while it is an appropriate milestone to celebrate and honor corporations and individuals who support minority economic development, it is also the time to examine current and future challenges and opportunities for both corporate America and minority businesses. It's time to look forward in the new millennium of change. America, its cities, corporations and minority businesses can all share in the pruning process which will help the ripening and growth of not only minority economic development, but economic development for all. 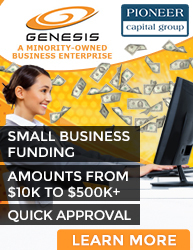 Genesis looks to your company to help level the playing field and put our company on an even keel so that we can compete in the marketplace. If your company is one of the leaders in encouraging first-tier suppliers to partner with MBEs in order to compete in today's environment Genesis looks to you to adopt a similar philosophy in allocating a certain percentage of its minority sourcing goal. Your commitment to the development of MBEs is that it helps suppliers not only to grow, but to diversify. Genesis would like to be more than just a provider of services; we would like to be your valued partner as well. Any corporation that wants to stay competitive must constantly seek new markets, new technologies, new products and new alliances. Considering the above, we believe it would be worthwhile for you to again view our suite of services available and learn more about our company by continuing reviewing this website.